Roderick Andrew Anthony Jude McDowall was born in London on September 17, 1928. As a child, he modeled before studying acting with Edith King-Hall, and appeared in a number of British films. Roddy didn’t truly blossom in his craft until his family moved to the States during World War II. A role in 1941’s How Green Was My Valley helped establish a foothold in the industry. He showed sensitivity and surprising depth at an early age. Two years later, he was given the lead in the classic Lassie Come Home, a moving tearjerker about a Yorkshire boy who gets separated (temporarily of course) from his Collie. It was during this shoot that McDowall developed a life long friendship with co-star Elizabeth Taylor. His elocution pitch perfect, young Roddy starred in a multitude of movies during the ‘40s and early '50s that ranged from the excellent (Macbeth in 1948) to the not so great, low-budget fare (1950’s Killer Shark). When film work became less frequent, Roddy moved to New York and worked in television and on Broadway. He even made his musical debut in Camelot alongside Julie Andrews and Richard Burton in 1960. That same year, The Twilight Zone gave the still youthful actor a meaty role in the episode People Are Alike All Over, as a doomed astronaut on a mission to Mars. It was becoming clear that Roddy would not succumb to the “curse” that befalls so many child actors. He worked more than ever before: as Malcolm in the underrated Doris Day chiller Midnight Lace; Octavian – Caesar Augustus in the overblown Cleopatra; Martin Ashley in Shock Treatment; and Alan Musgrave in the wonderfully weird Lord Love a Duck. He was in two episodes of Alfred Hitchcock Presents and on the Kraft Suspense Theatre, and even snagged a part as the villainous Bookworm on the live-action Batman series. It! (1967) was a fun UK horror in which Roddy played Arthur Primm, a museum assistant who brings a Golem statue to life in order to exact revenge against his rivals. In 1968, the sci-fi classic Planet of the Apes gave Roddy McDowall his most famous and enduring role with Cornelius. As the sympathetic archeologist and historian chimpanzee, he was one of the few voices of reason in the topsy turvy world. POTA is well remembered for a multitude of reasons but his contribution cannot be underestimated. A lesser actor might have gotten lost in the part, buried underneath the terrific Oscar-winning make-up by John Chambers. Roddy’s large, expressive eyes and elegant speech pattern were a tremendous asset, and together with Kim Hunter’s portrayal of his wife Zira, they brought their characters vividly to life. He passed on the immediate sequel, Beneath the Planet of the Apes, because he was in the process of directing his first and only feature, 1970’s The Devil’s Widow (AKA Tam Lin) starring Ava Gardner. However, Roddy returned to play Cornelius in Escape from the Planet of the Apes, and as his son Caesar in both Conquest of the Planet of the Apes and Battle for the Planet of the Apes. Monkey business aside, McDowall was terrific in the 1969 anthology pilot for the Night Gallery series. In the segment Cemetery, he was Jeremy Evans, an heir who murders his wealthy uncle to inherit his estate. There are a couple of great twists…and even though the Joan Crawford segment Eyes is the most celebrated, Cemetery is just as good and even more creepy. Roddy was a busy guy in 1971. Among his many works, he appeared in the mystery/black comedy Pretty Maids All in a Row; the TV thrillers Terror in the Sky and A Taste of Evil; and the family friendly Bedknobs and Broomsticks. There were roles in 1972’s blockbuster The Poseidon Adventure, and in the haunted house flick The Legend of Hell House (1973) - an updated variation of sorts on The Haunting. He was featured in Arnold (also '73), a comic fear picture with Stella Stevens, Elsa Lanchester and Victor Buono. The ape phenomenon was in full swing by 1974 with a re-release of all five films, and that fall, a series premiered on CBS based on the franchise. Roddy was back again - in yet another incarnation, this time as the chimp Galen. It co-starred James Naughton and Ron Harper…and although an excellent program, it ran for only a single season. It was a minor setback. Throughout the decade, Roddy was at the peak of his workload. There was the Made-for-Television The Elevator (’74), the 1976 mad scientist horror vehicle Embryo with Rock Hudson, and a second attempt at a weekly show with the short-lived The Fantastic Journey in 1977. He graced numerous TV series and feature films, far too many to mention. At age 57, he made one of his most successful pictures during a long and diverse career. In Fright Night (1985), he was Peter Vincent, an aging, hammy horror actor who gets caught up in the real-life world of vampires. The film was a big enough hit to spawn a sequel in 1988. Among his later genre outings: Dead of Winter (1987); Cutting Class (1989); Deadly Game (1991) for cable; The Evil Inside Me (1993); and Dead Man’s Island (1996) for television. He even lent his distinctive voice to Batman: The Animated Series and the Gargoyles cartoon. In addition to acting, he was also a professional photographer with four published books to his credit, the first of which was Double Exposure in 1966. McDowall was never a leading man or big “star” in the true sense of the word. He was something better: a consummate, hardworking professional who performed non-stop for most of his life. And because he was more of a character actor, he was able to stay above the fray and avoid all the pitfalls that come with superstardom. No scandal or fodder for the tabloids to be found. The fact he was gay was well known in and around Hollywood. Although not officially open about his orientation to those outside the industry, Roddy (to his credit) never felt pressure to get married or play the publicity machine ad nauseam. He died of cancer on October 3, 1998 at his Los Angeles home. In keeping with his low-key style, he specifically requested that a memorial not be held and his cremated ashes were scattered in the Pacific. 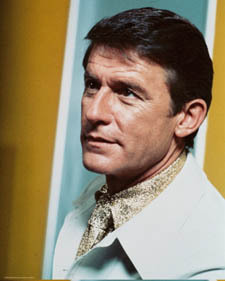 Roddy McDowall was posthumously honored by the Academy of Motion Picture Arts and Sciences, who named their vast photo archive after him. It was a sign of the respect and high regard in which he was held.